Inventory We are a resale marketplace, not a box office or venue. Ticket prices may exceed face value. This site is not owned by Mud Island Amphitheatre . The Mud Island Amphitheater is an aptly named venue located on the outskirts of the Memphis city line. The venue is located on a small peninsula by the Wolf River Harbor and the Mississippi River. 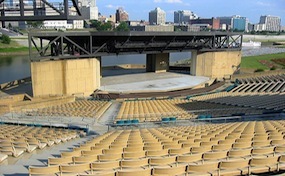 The Mud Island Amphitheater box office has a 5,000 seat capacity and has been open for over two decades. James Taylor is one of the most popular concerts for Mud Island Amphitheater tickets. The venue is generally only open for the summer concert series and will get a small number of performers on an annual basis. MudIsland.AmphitheatreMemphis.com is not currently associated with any official box office, venue, or primary website. Tickets may be priced well above or below face value and can change quickly with demand. We are a privately owned and operated company that concentrates mostly in the secondary ticket market. To order tickets to all Mud Island Amphitheater events simply click on the show of interest or call our operators at anytime.